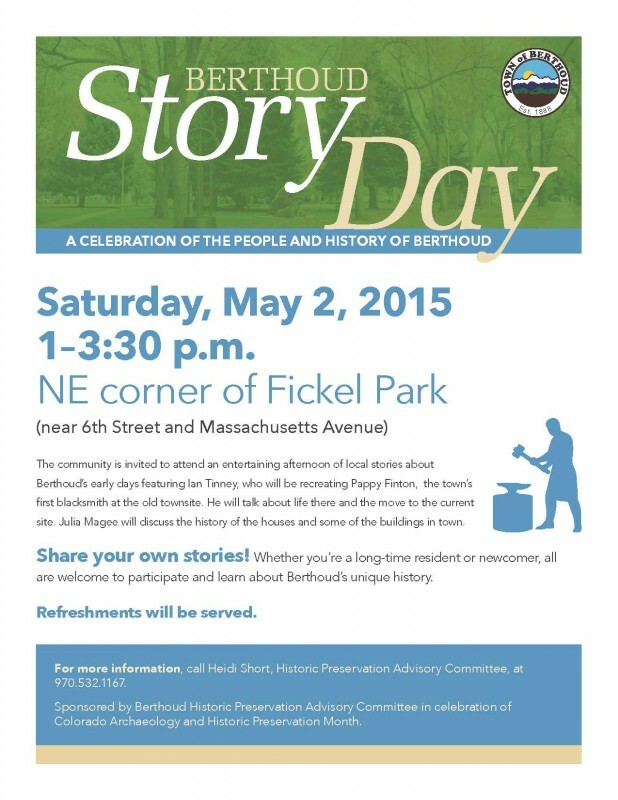 The public is invited to attend a special celebration of the people and history of Berthoud during the first Berthoud Story Day, Saturday, May 2, 2015, 1 – 3:30 p.m., at the NE corner of Fickel Park (near 6th Street and Massachusetts Avenue). Do you know who settled Berthoud? How did they make a living? Join us to hear stories from Ian Tinney, who will be recreating Pappy Finton, the town’s first blacksmith at the old townsite. He will talk about life there and the move to the current site. In addition, Julia Magee will talk about the history of the houses and some of the buildings in town. Share your own stories! Whether you’re a long-time resident or newcomer, all are welcome to participate by sharing your own stories while learning about Berthoud’s unique history. Refreshments will also be served. The event is sponsored by the Town of Berthoud and the Berthoud Historic Preservation Advisory Committee in celebration of Colorado Archaeology and Historic Preservation Month. For more information, call Heidi Short, a member of the Historic Preservation Advisory Committee at 970.532.1167. Situated 20 miles south of Fort Collins and 30 miles north of the Denver area, Berthoud is at the center of the Northern Colorado economic corridor. A progressive community at its heart, Berthoud provides a high quality of life with excellent public schools and family activities, flexible business expansion incentives and numerous land opportunities for developers and industries. Learn more at Berthoud.org or call us at 970.532.2643. Site contents copyright © 2019 Recorder Online	except as noted. All rights reserved. | 94 queries in 2.412 seconds.